März 2-9, 2018 - vertagt,,en,Schauen Sie sich Belize,,en,wir verschieben Sie diese Reise bis,,en,Irma,,en,betroffen jeden, der lebt und arbeitet in der British Virgin Islands,,en,Wir haben einen YouCaring Hilfsfond für unsere BVI-basierten Mitarbeiter einrichten,,en 2019. 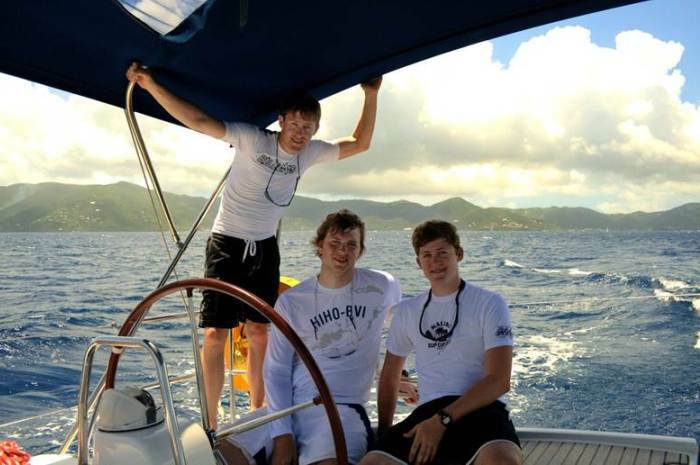 Check out our Belize sailing vacation! Because of the devastation Hurricane Irma caused to all of the charter fleets in the British Virgin Islands, we are postponing this cruise until 2019. 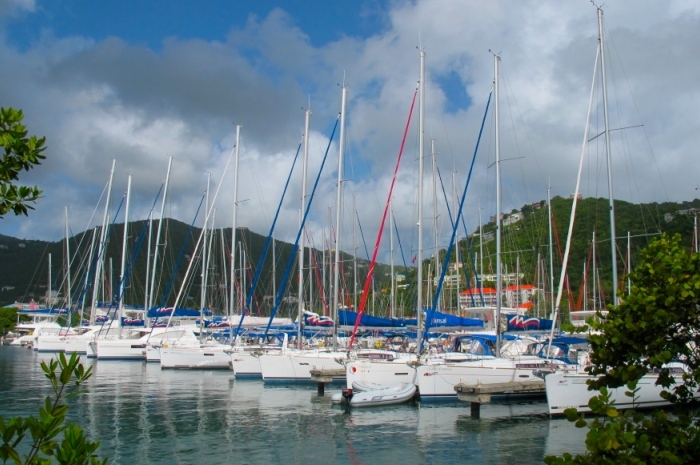 Irma affected everyone who lives and works in the British Virgin Islands, including the employees of Offshore Sailing School and Moorings/Sunsail who are coping with the aftermath. We have set up a YouCaring relief fund for our BVI-based employees. Should you wish to help out, here is the link. These islands are so alluringly beautiful, new and seasoned cruisers flock to the crystal clear waters and verdant shores of British Virgin Islands to go sailing throughout the year. Cruising from one island to the other is a delight. The passages are easy between anchorages. Am allerbesten, there is so much to see and do in the water and ashore at each destination, before the trip is over you’ll be making plans to return another year. Snorkeling is amazing throughout the islands. Easterly tradewinds, ranging from 15 bis 25 mph, propel you through comfortable passages to still-water bays and harbors. Temperatures hover in the mid-eighties by day, 70’s at night, with average water temperature around 77 °F. What better place for a spring break getaway? This year’s sailing on the British Virgin Islands adventure is on six beautiful Moorings 51.4 Einrumpfboote, with four cabins and four en-suite bathrooms, big main salons and lots of cockpit and deck space for all to enjoy. Come alone and sail on a “singles” Boot. Bring your spouse or best friend, and share this 2018 spring break cruise experience with like minded couples. 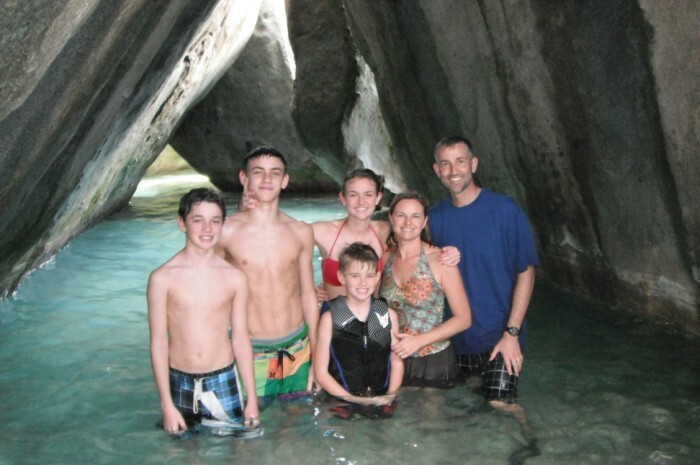 Bring the whole family for a hassle-free cruising vacation you’ll long remember. Three different package categories are available to accommodate all. 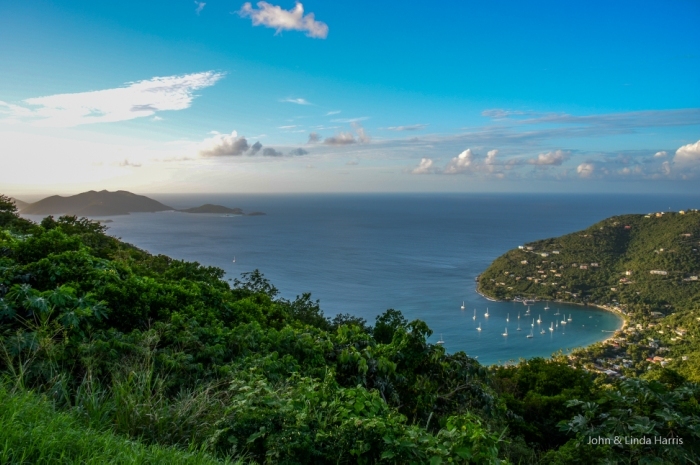 The home base of The Moorings, host for this spring-break sailing adventure, is in Road Town on Tortola – packed with cruising yachts of all sizes, and happy sailors about to embark on or just returning from an exciting island vacation under sail. Plan to arrive Friday, März 2 and depart the following Friday, März 9 – via direct flights from Miami or San Juan to EIS airport on Tortola, a 30-minute taxi ride to the base. You can also fly direct to St. Thomas in the US Virgins from Miami and other US airports, then take a 40-minute ferry to Tortola. All the islands have something special to offer for everyone on the spring break cruise in 2018. Your first night is on your assigned Moorings 51.4 at The Moorings base on Wickhams Cay II. With restaurants and shops just off the docks, this is a nice way to get acclimated to the island lifestyle after a day of traveling. A meet and greet party hosted by cruise leaders Nate and Heather Atwater, is held that night dockside at The Mariner Inn. 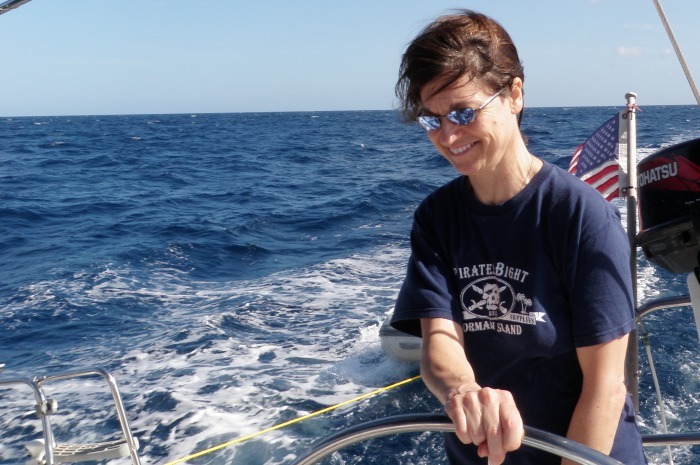 Nate and Heather are Offshore Sailing School’s flotilla cruise leader guides, familiar with many of you who have already participated on a Flotilla Cruise with Colgate Sailing Adventures. They are special people who make YOU feel special too. The next morning, after boat and navigation check outs, you set sail – for six glorious days of island hopping, superb sailing, Schnorcheln, Baden, exploring and more. 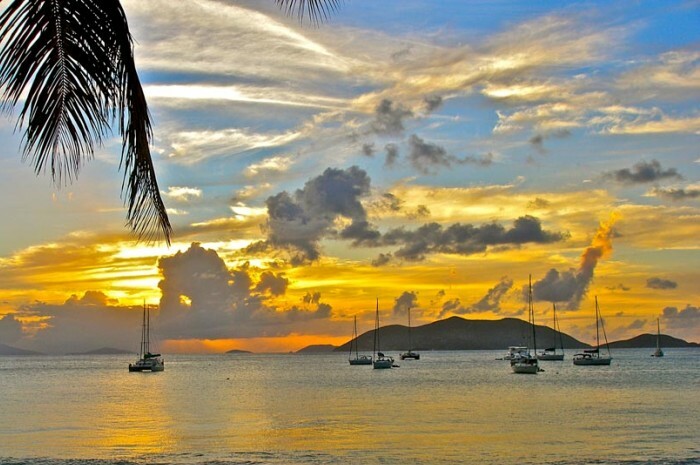 Here’s where you’ll sail on this British Virgin Islands vacation, always subject to change of course. 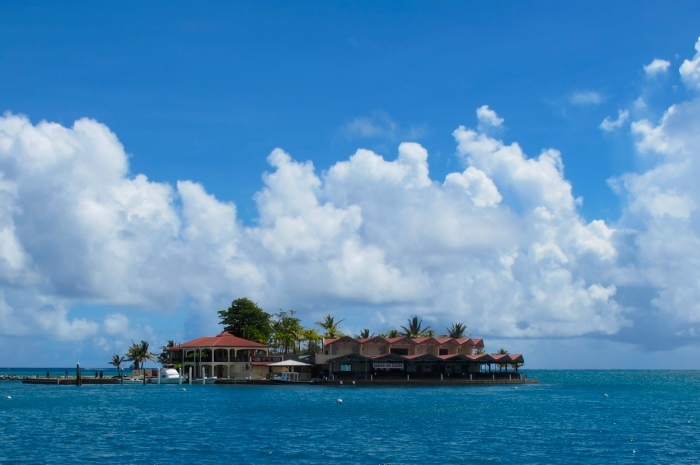 This fun destination is a nice reach across Sir Francis Drake Channel from The Moorings base to Cooper Island’s main harbor in Manchioneel Bay. Pick up moorings, put the ladders down and go for a delightful swim. 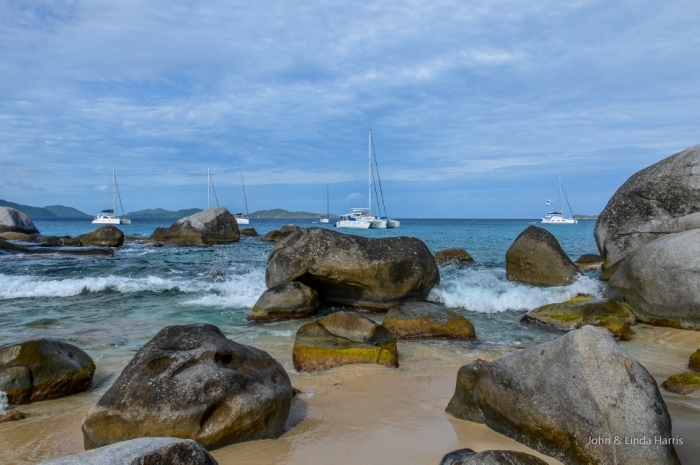 Take the dinghy to one of the rocky shorelines for your first snorkeling adventure. Then dinghy ashore to Cooper Island Beach Club and the Seagrape Boutique. A refreshing iced coffee, ice cream or cold island concoction might be in store for you and your crew mates before you head back to prepare dinner aboard. You can also dine ashore at the club, or just enjoy a cold drink at the bar as you watch a spectacular sunset illuminate masts of the many yachts moored in the bay. 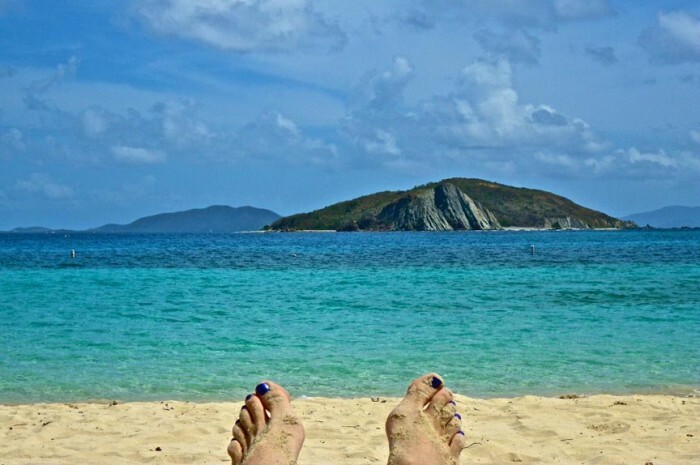 Today you beat North to Virgin Gorda, one of the largest BVI islands. Nach dem Weg, the fleet will pick up moorings outside The Baths – a scenic site with huge boulders, tunnels, pools and caves. Take a waterproof camera for photos of yourself and crewmates in the mysterious shadows of these huge boulders! After exploring and lunch, the fleet will continue up to North Sound – home to peaceful beaches, luxury resorts, great dining ashore, und natürlich, more spectacular snorkeling. 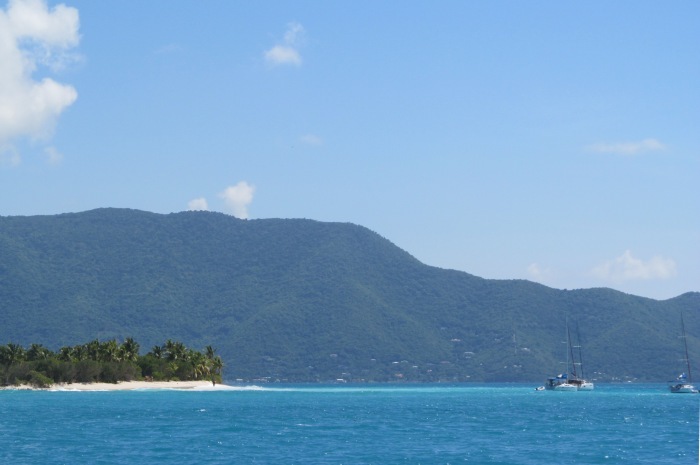 There is so much to do, and so much space to sail in the very protected waters of North Sound, die Flotte wird einen zweiten Tag auf dieser BVI Segeltörn verbringen. Hire a taxi for a sightseeing tour, rent a windsurfer, kayak or paddle board. Have lunch or dinner at a deliciously funky waterside eatery, or head to Saba Rock where fish line up to feed in beckoning lights, The Bitter End Yacht Club, Leverick Bay Resort, Yacht Club Costa Smeralda (if it is still open to non-members), for a casual or more formal meal with divine views of the Sound’s sailing activity. Of course, there are shops for island souvenirs and t-shirts too. Today is a nice sail out of North Sound around Mosquito Point and then across the Channel on a reach to Marina Cay, nestled behind a protective reef. 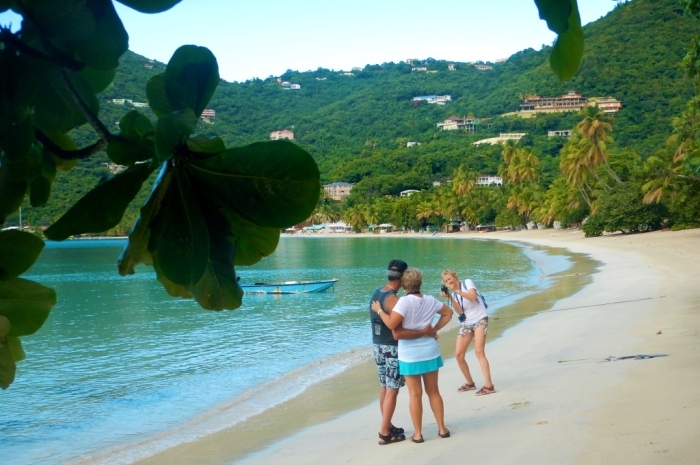 You are now near the north end of Tortola with excellent snorkeling and Pusser’s Company Store and beachside restaurant on this tiny island. Anchor or pick up a mooring, and set out to explore. Or just lounge aboard in anticipation of a delightful dinner aboard or ashore under the stars. 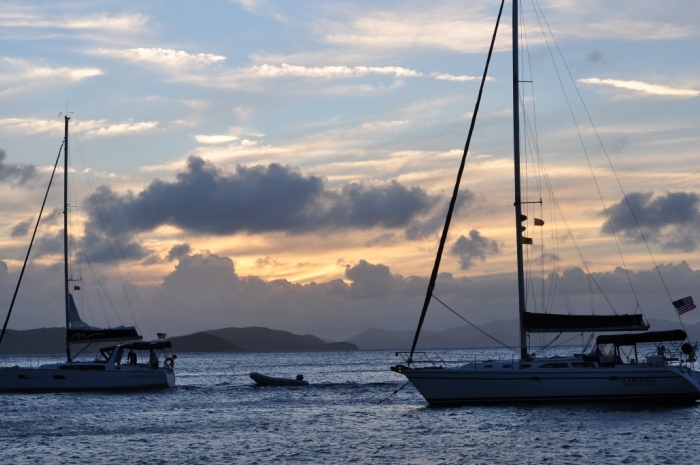 Nearby is elegant Scrub Island Resort, Spa & Marina – home to Offshore Sailing School. You may want to dinghy over there for a peak at this amazing island resort with a two-tiered swim-up bar pool and enticing slide from one pool level to the next. No sailing vacation in the British Virgin Islands is worth its salt without stopping at tiny Sandy Cay. Dinghy or swim ashore to the lovely sandy beach and explore inland on a path through dense foliage to the volcanic rock shore on the opposite side. Take your camera, again, for shots of land crabs scuttling about, and beautiful vistas back to the anchored boats. Then the spring break cruise 2018 fleet sails on a broad reach over to the crescent-shaped Cane Garden Bay, where you can anchor or pick up a mooring. At Cane Garden Bay, kayak and windsurf rentals are available and it’s a fun walk down to the old Callwood rum distillery where you can purchase locally produced rum. Spend the evening lounging aboard, or head ashore to the many beach bars and restaurants (open for breakfast and lunch too). Live music is almost always available at one or more of the eateries like Quinto’s Gazebo, the Big Banana Paradise Club, Rhymer’s Beach Bar and Restaurant, Stanley’s Welcome Bar, Myett’s Garden & Grille Restaurant, De Wedding, and the Elm Bar and Gift Shop. Try the pumpkin fritters or conch at Quito’s Gazebo as owner Quito Rymer serenades with his guitar. 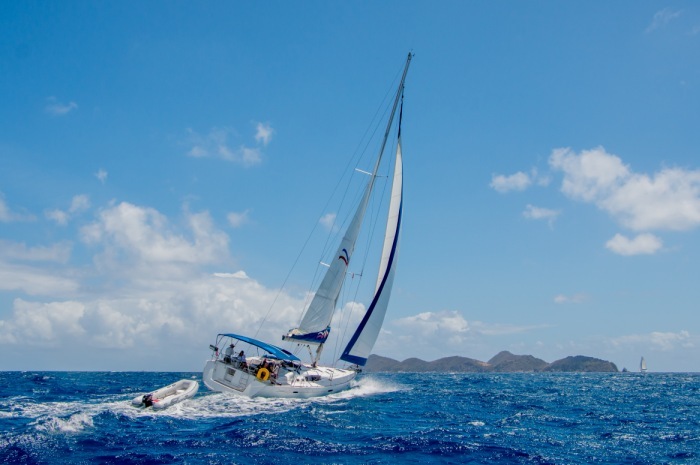 Today you enjoy a varied sail – running and reaching – between the southern tip of Tortola with St. John on your starboard side, and then across to Norman Island. Before heading in to pick up moorings, the fleet might stop at the Indians for amazing snorkeling. The Bight is a popular anchorage with many moorings, and you want to get there before 3 p.m. The four caves at Treasure Point just outside the entrance are easily reached by dinghy. Breathtaking with shimmering purple and rust colored orange interior walls, you can swim into them and see teeming sea life in shallow water. Some say the booty of Treasure Island is buried here. The Bight is also famous for a drink at its floating restaurant, Willy T, and dinner ashore at Pirates Bight restaurant and bar. You will definitely wonder where the week went as you head out after breakfast, on a beat and close reach back to The Moorings at Wickhams Cay, arriving no later than noon. Final check outs, sad good-byes, and it’s time to head home to cold climes with envious tans, tons of photos and memories that can’t fade away, at least until your next Colgate Sailing Adventures Flotilla Cruise. For this fabulous Caribbean flotilla spring break cruise in 2018 we have reserved six 51.4 Exclusive monohulls. “Exclusive” means the boats are no more than three years old. These are really fun boats to sail, with dual helms and excellent visibility. All lines lead aft for easy handling, and the yachts are fully equipped with Raymarine Navigation systems, elektrische Ankerwinde und Winden, bow thrusters and a 75 HP Yanmar engine. Topsides the boat has spacious decks and a big cockpit with fold-down swim platform and shower, bench seating and a large table with icebox and additional storage compartments. The Moorings 51.4 yachts stay cool below, air-conditioned when the generator is running. There’s plenty of room for all in the large saloon featuring cushioned seating, ein Tisch, multiple windows, und Radio / CD / MP3-Player mit Lautsprechern im ganzen. The galley has everything you need for dining at sea. The navigation station to port behind the saloon provides a chart table with reading light, bookshelf and lots of storage space. Four double cabins each with their own bathroom provide comfortable accommodations for groups of up to eight. For family buy-the-boat options, the saloon table is convertible for up to two guests for a maximum of 11 passengers. Payment Terms: A 30% deposit is required when you sign up. Final payment plus the $300 per person security deposit is required by November 1, 2017. New purchases November 1 or after require full payment and the security deposit. Cancellations received prior to November 1 – all monies paid are refunded less a $400 cancellation and handling fee. After November 1, no refunds for cancellations or transfers to another Offshore Sailing School activity. Please buy trip insurance to avoid any loss of monies should an emergency occur that causes you to cancel. 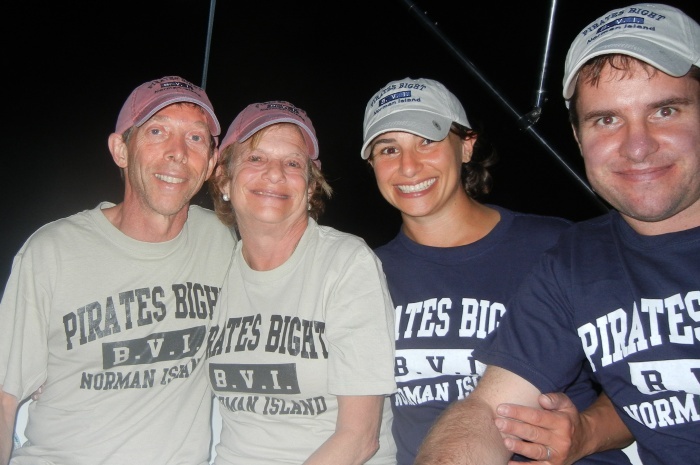 If you gather friends, or family to sail as a unit on one of the boats in the fleet, special pricing is below. The group must book and pay in full for the entire boat charter package when the reservation is made and there are no refunds or transfers allowed. Please buy trip insurance to avoid any loss of monies should an emergency occur that causes you to cancel. 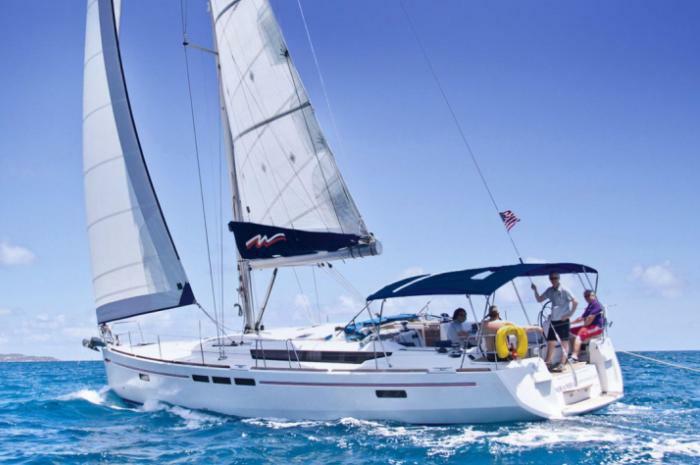 Couples Boat Package: Minimum three couples, maximum four, each couple sharing a cabin – $2465 per person if your group is three couples ($2295 per person if an Offshore Sailing School grad); $2160 per person if your group is four couples ($1920 per person if an Offshore Sailing School grad). Singles Boat Package: Minimum four singles, maximum five in private cabins and using the convertible main salon. You must bring your own group of four or five singles to share and sail together on the same boat. $2720 pro Person ($2465 if an Offshore Sailing School grad). Refundable Security Deposit Required: A $300 per person security deposit is required with your final or full payment. This covers any loss or damage experienced by any one of the boats during the cruise. If no damage or loss, the deposit is refunded within 30 days of the end of the cruise. 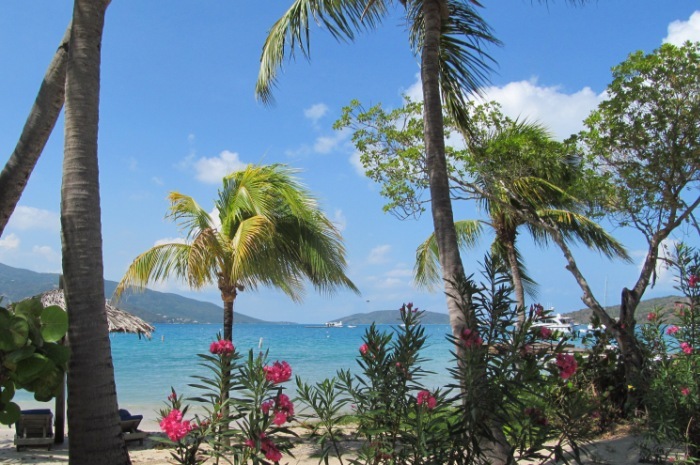 When you sign up for this sailing British Virgin Islands vacation, we send a complete handbook with all kinds of information, including WiFi and Cellular use, electricity aboard, and a whole lot more. This is one of the most popular cruising grounds, so zögern Sie nicht für diese ganz spezielle BVI Segeltörn in der Anmeldung.